October | 2012 | Vikings, Books, etc. It’s Halloween, so I suppose I should post a little something about Scandinavian ghosts and monsters. 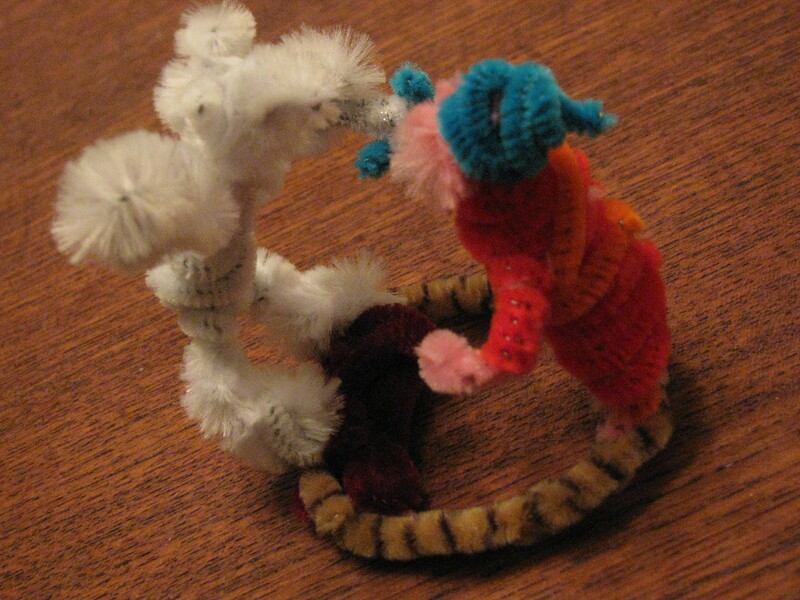 The pictures here are of a pipe-cleaner sculpture from a former student, representing one of the many monster fights in Grettis saga (also available in this translation), one of my favorites, and probably the one I have taught the most times over the years. Can’t remember exactly which monster fight this is– probably the fight with the troll-woman just before the final chapter of Grettir’s life on Drangey, though I think my first guess was that it was the fight with Glámr, the pagan Swedish immigrant to Iceland turned draugr. A draugr = a ghost, but corporeal–a zombie, but not hungry for brains, and much more articulate, and not decaying but instead superhumanly strong, troublesome, and “walking again” because of something left undone, often an improper burial. 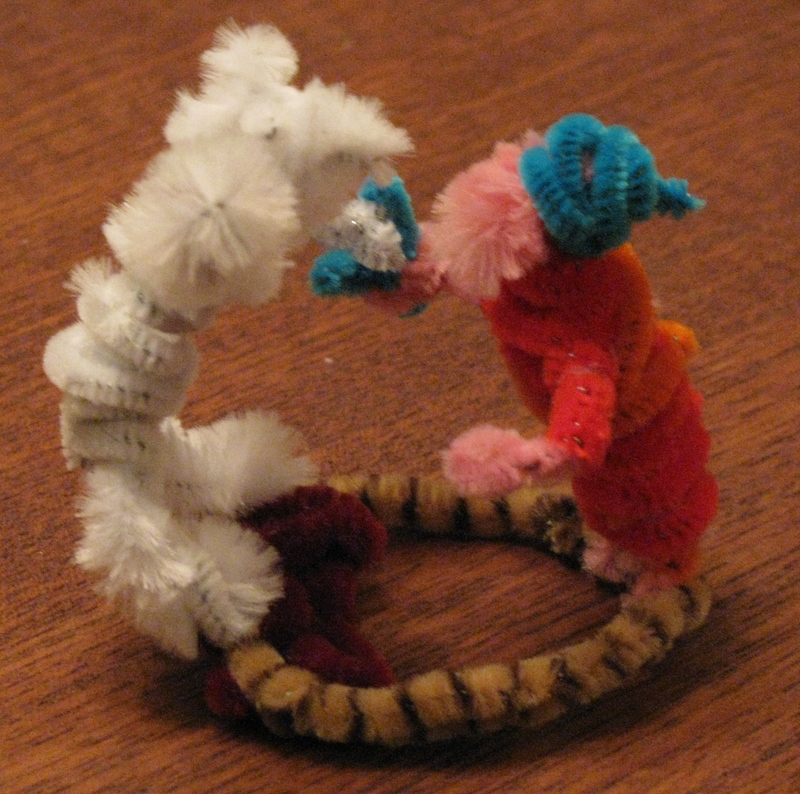 While I’ve labeled one of these a fight with a “troll” and another a fight with a “ghost,” really both are “troll” fights, in the older sense of the word–monstrous or superhuman in the sense of transcending that which is normal–Grettir himself invites comparison to the monsters he fights, as a super-strong outsider (literally–he is an outlaw), and the similarly cantankerous Egill Skallagrímsson is at one point said to be “large as a troll” (the Icelandic scholar Ármann Jakobsson has written on this an related topics). Grettis saga is relatively late for one of the classical “Sagas of Icelanders,” which may explain why it is just bursting with encounters with the supernatural–other Sagas of Icelanders (aka Family Sagas) may have occasional ghosts or other otherworldly types showing up, but overall they are less sensational, and correspond more to our contemporary sense of “history,” while the legendary sagas (or “sagas of ancient times”) are… well, fantasy novels, basically. More akin to the Romances, if we are more conscious of the time in which they are written, but also reworking stories which seem to go back to the Viking age, and often claim to go back further. The setting of Grettis saga is standard Family Saga, however, and the monster fights themselves (there are a lot of them! ), as well as Grettir’s character and his representation of himself at a few points in the saga, all work together to mediate between the heroic past and more mundane present of medieval Iceland. Get a copy–if you have trouble appreciating the larger vision of the saga (many don’t like it as much as the more central classics), try out Kathryn Hume’s article “The Thematic Design of Grettis saga.” It’s available on JSTOR, if you have access to that. Many contested connections of Beowulf as well, if you want to bring some even more famous medieval monsters into it. That’s a medieval monster story for you. As far as modern Scandi scary stories go, I’m getting into John Ajvide Lindqvist’s work. You may have heard of his unusual vampire movie, Let the Right One In (available on Netflix, last I checked), originally a novel. I am currently reading his novel Handling the Undead, a treatment of the zombie genre which is less about eating brains, and more about what we would do if suddenly our loved ones came back to “life,” even if they were clearly not themselves, not entirely at least (and far less articulate than a draugr like Glámr). I’m around halfway through, and at the moment it seems to be revolving around not only issues of death and life and loss, but also the question of who exactly gets custody of these “reliving”–the government or their families? What are the boundaries between the phenomenon as a national health problem and as a crisis of personal relationships? Not your typical thrilling brain-chase, but I’ve found it disturbing enough–if zombie stories normally gloss over the actual trauma of the impossibly concrete confrontation with death and loss that the return of the dead implies, the absence of the usual horror-film bells and whistles in this book allows mortality and mourning to come to the forefront in a very powerful way. I had to put the book away for a while today– it was just too much (plus I was eating lunch…) Anyway, I highly recommend it so far, even though I’m not actually a horror fan and get a bit grossed out by the book at times. Plan on teaching it next semester, so we’ll see what my students think! That’s it, a bit late for a Halloween post, but there ya go! Remember, if you need a costume, check out my links in my post on dressing like a Viking! Dress like a Viking for Halloween! Some basic Viking get-ups (sorry, they are a bit sloppy–only had time to throw this together real quick late last night). Also, let me remind you that, while we might use the term “Viking” today to refer to anyone living in the ancient North, the term actually just meant “pirate” back then. These are my own versions of the illustrations found on page 36 of Else Roesdahl’s The Vikings (current paperback edition). Her caption: “Male dress with trousers, tunic and cloak fastened with a brooch. Female dress with finely pleated shift, over-dress and oval brooches.” Check out her book for further details. Out of the books I have with me right now, I also found good descriptions in Richard Hall’s The World of the Vikings and Jacqueline Simpson’s The Viking World (Vikings seem to have their own world in a lot of these titles). You might want to check out this article as well, which points out that the ancient Norsemen actually dressed much more ornately and colorfully than we often believe (I guess we are just too used to black-and-white line illustrations in paperback books…) I am a fan of simpler styles myself, regardless of period, so my cartoony illustrations have usually involved some version of the male get-up shown above. I’ve looked over this website as well, and it looks pretty good–I’ve gotten a bit frustrated by the Hurstwic site in the past because of the large number of students plagiarizing from it, and for academic papers I ask students to limit themselves to peer-reviewed journals or introductory books from academic publishes, but this is an excellent and thorough site covering a lot of information which is a bit difficult for undergraduates to get their hands on–great “trickle-down.” I see that Dr. Short has at least one book out in addition to a few DVDs, but haven’t had a chance to look at any of those yet. You can’t really see the woman’s hair in my pic, but in the illustration in Roesdahl’s book I believe the hair is supposed to derive from some of the braids/knots we see in women’s hair in some viking age art. In the examples I have here, we’ve got (possibly) a Valkyrie welcoming Odin or a dead warrior to Valhalla (the usual interpretation, anyway), and (ostensibly) the giantess Hyrrokkin from the story of Baldr’s funeral. Well, that’s all for now. Sorry, Viking costumes aren’t really my specialty… but most introductory books on the Vikings have some notes on this, so check out the ones I’ve listed, or any others you can find! I’m kind of a space nerd (you have probably realized this by now, given all my mentions of science fiction novels and films). Yes, OK, maybe my PhD in Scandinavian Studies and my dissertation on Viking poetry about pictures on shields are not going to get me a job at NASA (not until we meet the Space Vikings, anyway), but growing up I got pretty much an equivalent kick out of reading about old myths and reading Arthur C Clarke or watching Star Wars (please note though, I am NOT a Campbellian, even if I just mentioned Star Wars and myth in the same sentence…), and even now I get a similar thrill from both my own profession and the world of space exploration. Both have to do with expanding the world we live in, expanding our vision of reality at the same time that we realize how impossible it is to visualize it all. There is something in common between the experience of being confronted with an alien semantic universe and the experience of grasping, finally, the fact that the moon really is a whole other WORLD, hanging up there in the blue, an experience I had shortly after reading Gene Wolfe‘s The Fifth Head of Cerberus, which exaggerates this situation by having twin planets circle each other at a relatively close distance. I still have occasional moments when I can “get it” once more, but even then it’s only partial. Who really has room for a universe large enough to let the moon be a world, rather than just a bit of scenery? (though I do certainly appreciate it as scenery too…) This is more of a process, a movement, than a goal. If we thought there were an end-point we were somehow aimed at in this process of understanding Others or the Universe, then we’ve missed the point–then it has become more about grasping, controlling, owning, rather than about being transformed, engaging someone or something “on its own terms,” insofar as that is possible. The “subject-object” paradigm is probably impossible to entirely do away with when it comes to the sort of “scientific understanding” that we find in everything from mythology and anthropology to astronomy and physics, but I think it is also productive to destabilize this binary a bit–in fact, we might say that that is essential in the act of science itself. Studying something may inherently mean objectivizing it, but unless we are going to just let the object be a screen onto which we project our own meanings, we have to be open to hearing it “speak”–we have to grant some degree of subjectivity to the “object,” allow it to subvert our expectations, to challenge our attempts to sort meaning out of the data we find–even to challenge our ideas about what constitutes “data.” Incidentally, I first encountered this idea in this book, though I hear it shows up in archaeological theory too. OK, all that (it was more than I meant to say) to set up THIS COOL NEW DISCOVERY!!!! Earth sized!! Well, OK, it’s too close to the star to actually be “earth-LIKE,” but it is nevertheless exciting to get the first evidence that the nearest stellar system has planets! And OK, it may be close, but it is still too far to get right now–but it’s a pretty awesome find when there is so much in the news right now the possibilities of interstellar flight, like this, and this! It certainly gets the imagination going– Alpha Centauri has featured in a TON of science fiction– while still impossibly distant, it is relatively close and so allows writers and readers to entertain the illusion of realism in an otherwise very unrealistic genre. In the late sequels to Isaac Asimov’s Foundation series Alpha Centauri showed up as a planet encountered so far in the distant past of the galaxy that it had been forgotten–but more often it shows up as a first stop in the early exploration of interstellar space, as with the film Avatar (which I STILL haven’t seen– I was too busy when it came out). The poster illustration for the conference– I hope the library doesn’t mind me reposting it here! Click the pic to go to the webpage for the conference. Gosh, I just have too many things to post about and no time to write about them. We are having several guests from Scandinavia come to Gustavus to talk about the genre of the deckare, aka the Scandinavian Crime novel. For a description of the conference, the speakers, and a few articles and books on the topics, click the pic to the right of the screen. The deckare has been gaining in popularity worldwide after the success of The Girl with the Dragon Tattoo (though the Swedish title means “Men who hate women”) by Stieg Larsson, although the genre has certainly been translated into English a few times before. I recently read the Danish author Peter Høeg‘s novel The Quiet Girl, and really enjoyed it (OK, the ending was a bit much, but still…) As with his earlier novel Smilla’s Sense of Snow (which became a movie as well), The Quiet Girl has a paranormal/science-fictional/supernatural (however you want to interpret it) twist to the deckare genre, something I enjoy, having grown up with science fiction and fantasy rather than crime novels. To get ready for this conference I also watched a couple episodes of Wallander, based on the books by Henning Mankell, a big name in the genre. I don’t actually like crime shows very much–too much violence and gore, I guess. I’m a softy. Whether or not you can join us for this conference, you should certainly buy lots and lots of books by our guest authors! We have two novelists from Sweden, Helene Tursten and Kristina Ohlsson (just saw that she had to cancel, how sad! 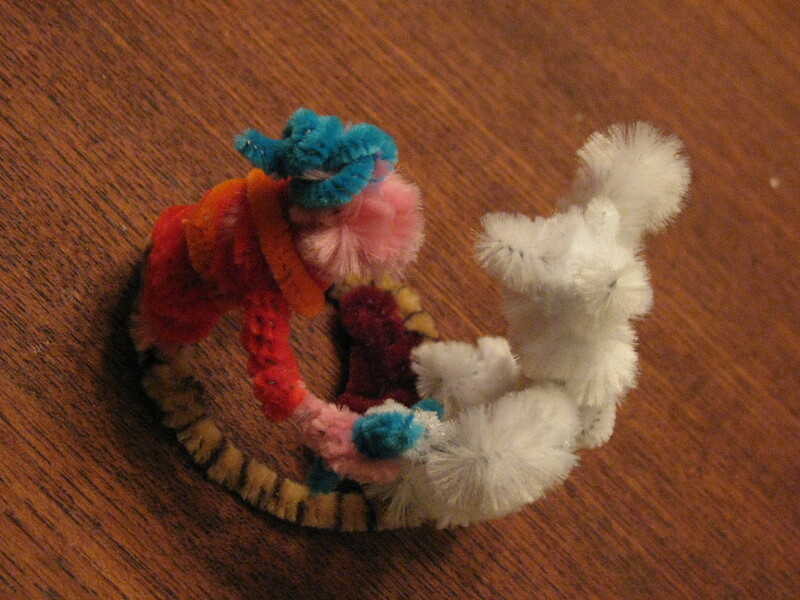 ), and two Danish coauthors, Lene Kaaberbøl and Agnete Friis. I’m especially interested in reading some of Lene’s fantasy novels–I find fantasy and science fiction to be pretty rare and peripheral in Scandinavia, even if there is a pretty big audience for translated (or untranslated) English language fantasy and sci-fi. I believe Lene’s fantasies are still written for young-adult or younger, but hey, I just like finding Scandinavian lit in the genres I like most! I will post more about these genres in Scandinavia later– it’s pretty interesting! (well, imho) We also have the Swedish scholar Kerstin Bergman coming–you can find an article by her available free online, with a link on the conference webpage! Well, that took me past my bedtime. I will see if I can put together more of an update of this, the royal visit, and the Nobel conference some other time– but no promises! Sorry, no time to write a long post now, because I’M GOING TO EAT LUNCH WITH THE KING OF SWEDEN. Well, I probably won’t actually get to meet him, but the Scandinavian department got to bypass the lottery for the tix to the luncheon, so I will be there! I’m a big fan of Dresden Codak and also enjoy following Aaron Diaz’s blog on comic theory (and stuff). I was pretty thrilled when I saw this morning that Mr Diaz has started a new project based on The Silmarillion. When I first read The Silmarillion it actually became my favorite over LOTR for a while. Not so surprising that I went on to study Norse mythology, I suppose. I am not sure whether I am allowed to repost his picture, so just follow the link. Meanwhile I’ll just throw up a pic of the original cover for The Silmarillion from Wikipedia commons. This first picture in Diaz’ series is a nice interpretation of the Music of the Ainur (Ainulindalë)– halfway between “Let there be light” and the Big Bang. Aaron Diaz has a very romantic view of science (I mean that in a positive way, not a disparaging way), and I think that comes out in the potential ambiguity of the subject– divine music, the light commanded into existence in Genesis 1, or poetic representation of time and space exploding into existence? Science does not make the world less poetic or beautiful, but rather gives us a more complex and nuanced palette to work with in our engagement with and understanding of the world. Tolkien was Catholic, but hardly a Creationist, and I think he would have appreciated this interpretation. OK, out of time, but couldn’t help sharing! Looking forward to seeing the rest of this project. Alfred Nobel. Image from Wikipedia commons. Live streaming of the Nobel Conference on the Global Ocean at Gustavus! More about the program here. I’m hoping they will also add the videos of the talks to an online archive, since I won’t be able to go to or stream all of them. The Nobel conference has been going on at Gustavus for 48 years, and, as far as I can tell from this one, seems to be more of a “trickle down” conference rather than a full blown academic conference. Think Ted Talks or something along those lines, bringing the general public up to speed re: the state of the field. Great role for a liberal arts college like Gustavus, I think. Gosh, lots going on this week– will try to get around to posting about the Royal Visit soon, as well as the upcoming Scandinavian Crime Fiction Conference.